‘I found the novel fascinating .. Tallis has crafted a skillful exercise in neo-Gothic horror.’ The Washington Post. ‘The novel is an elegantly constructed psychiatric Gothic, all spires sand gargoyles and ghostly echoes – the sort of vast, dread edifice we sometimes build around ourselves when the lights go out.’ New York Times. ‘Deliciously chilling. ’ The Providence Journal. ‘I found this suspense novel to be one of my year’s favorite reads … Highly recommended for fans of Ruth Rendell and Caleb Carr.’ The Book Maven. ‘ .. an authentic psychological horror constructed of dreams, reality, perceived reality and the supernatural.’ Scream Magazine. ‘Edgar award-nominated Tallis is in fine form in this gothic flavored thriller set in the 1950s.The remote, seaside village makes the perfect venue for this mystery with ghostly elements …’ Library Journal. When promising young psychiatrist, James Richardson, is offered the job opportunity of a lifetime by the charismatic Dr. Hugh Maitland, he is thrilled. Setting off to take up his post at Wyldehope Hall in deepest Suffolk, Richardson doesn’t look back. One of his tasks is to manage Maitland’s most controversial project – a pioneering therapy in which extremely disturbed patients are kept asleep for months. If this radical and potentially dangerous procedure is successful, it could mean professional glory for both doctors. As Richardson settles into his new life, he begins to sense something uncanny about the sleeping patients – six women, forsaken by society. Why is Maitland unwilling to discuss their past lives? Why is the trainee nurse so on edge when she spends nights alone with them? And what can it mean when all the sleepers start dreaming at the same time? 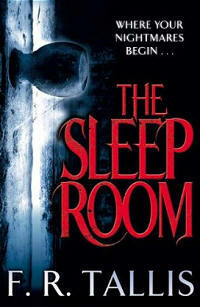 In this atmospheric re-invention of the ghost story, Richardson finds himself questioning everything he knows about the human mind, as he attempts to uncover the shocking secrets of The Sleep Room …. In 2009 I listened to a BBC Radio 4 documentary called ‘Revealing the Mind Bender General’. It was about the controversial psychiatrist William Sargant and his advocacy of narcosis or deep sleep therapy. This treatment was originally developed in the 1920s and involved putting patients to sleep for long periods of time, sometimes months. Sargant undertook deep sleep therapy on Ward 5 of the Royal Waterloo Hospital in London. It was also known as the sleep room. 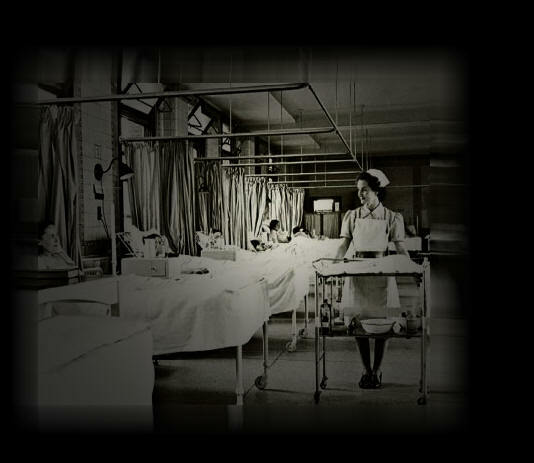 I found the image of a darkened ward full of slumbering patients both powerful and haunting and knew immediately that it would one day serve as the defining image of a supernatural novel. 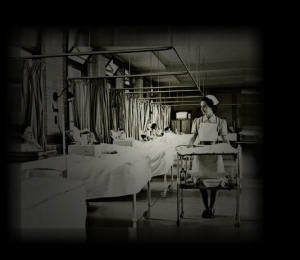 In spite of calls for psychiatry to become a more compassionate discipline throughout the 1960s, Ward 5 was accepting patients until the early 1970s. No medical records survive. Sargant destroyed them all before his retirement. The ghost story is one of literatures hardy perennials. It never goes out of fashion, but it is also the victim of its own success because constant repetition has made the form tired and predictable. All ghost stories follow the same formula. Something bad has happened in the past. Spirits return and frighten someone in the present. Sometimes – but not always – the spirits are laid to rest. Before writing THE SLEEP ROOM I thought long and hard about ghost stories and decided that if I was going to attempt one, it would have to be a departure from the standard model. My ghost would have to be – to some extent – new. I also had a hunch that a sleep room full of slumbering patients might provide me with some clues as to how I might refresh the old formula. As far as I’m concerned, the last time anybody did something radical with the ghost story was 1898. In THE TURN OF THE SCREW, Henry James introduced a psychological element. It can be read as a ghost story or alternatively, a case study. James urges us to consider the possible links between a governess’s repressed sexuality and the occurrence of the supernatural phenomena that she experiences. Are the ghosts real? Or are they the hallucinations of a hysteric. Many fine 20th century writers responded to James’s innovation, most notably May Sinclair and Shirley Jackson; however, the psychological ghost story has never been taken to its logical extreme – for me, a tantalizing prospect. A hundred years after THE TURN OF THE SCREW and the birth of psychoanalysis, what ghosts are we obliged to encounter? I found them waiting for me in THE SLEEP ROOM.